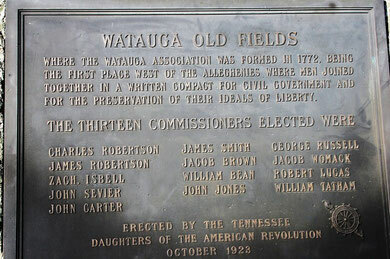 The people who moved down the valley from Virginia and across the mountains from North Carolina in the early 18th century, discovered the Old Fields along the Watauga River. They assumed that the Cherokee had cleared the land for cultivation. Cherokee lore indicates that the land was already cleared when they arrived. As the Watauga region was settled, the Old Fields were planted with corn; forts were built and treaties were signed with the Indians. The settlement of this region was the beginning of the expansion of our nation from the original thirteen colonies. It is a fascinating history. The Overmountain Men mustered here in 1780 and Reverend Samuel Doak preached a sermon to the men who were preparing to march to King's Mountain to fight the British. We sing onthe third Sunday at 2:00 p.m. I send out e-mails regarding this and other shape note information. Use the "send an email from the menu list (toward the bottom) to request this. Most people around here know of shape note singing. Some recall singing in the past. Many know of family members who sang. Note the past tense. Because this tradition cannot be found on television. It's not played on the radio. There are no shape note concert tours. Many of us think we "can't sing a lick". Or we have been told we should sing "solo" (so low that no one can hear us.) We will have no more of this! One day we came to our first shape note singing. We were drawn by curiosity of what this old time thing might be like. We were warmly welcomed and invited to sing with the singers. But, we sat in the back and listened. And we decided that we wanted more of this. We came back. We found our place in the square and over time, began to learn to sing this music. It took some time and some practice and a good deal of travel, because there was not so much singing nearby. We sing this music because it satisfies our soul to join in sweet harmony with friends. And now we want to share it. Come sit a spell. Let's sing.